Resource center Finding Help for Hydrocodone Addiction How Long Does Hydrocodone Withdrawal Last? Like most opioids, hydrocodone traces its origins to morphine. Morphine is the main ingredient that is extracted from opium, which is also the branch of the chemical conversion process that eventually leads to the manufacture of heroin. Morphine’s derivation from opium is what gives it the painkilling effects that make it so popular, by attaching to the brain’s opioid receptors to dull the sensations of pain and to induce feelings of euphoric relaxation. The journal Support Care in Cancer says that morphine’s effectiveness as a painkiller makes it the “most practical and versatile” medication for treating chronic pain in patients. However, that mechanism is also what leads to morphine being so addictive, leading the U.S. Drug Enforcement Administration to categorize it as a Schedule II drug(sharing space with other substances like cocaine and methamphetamine). As a Schedule II drug, morphine’s legitimate medical uses are recognized (albeit with severe restrictions in terms of dosage and prescription), but its high potential for abuse, and capacity to cause psychological and physical dependence, place it among some of the most controlled substances in the United States. Also on the list of Schedule II drugs is hydrocodone (sold under the brand name Vicodin). Like morphine, hydrocodone is an opioid. As an opioid, hydrocodone is prescribed to help patients overcome levels of pain that range from mild to moderate, but it is also useful for suppressing coughs. These features are also shared by another opioid painkiller, codeine (which is also derived from opium, albeit more naturally than the semi-synthetic hydrocodone). Hydrocodone and codeine cause the same range of side effects in users, such as dizziness, nausea and vomiting and constipation. However, hydrocodone is more potent than codeine, so it causes stronger symptoms, going so far as to make individuals experience insomnia and even hyperactivity. The potency of hydrocodone is what sets it apart from the otherwise-similar codeine, making it the most frequently prescribed opioid in America and the drug most associated with opioid abuse (either legal or otherwise), according to the Drug Enforcement Administration. Hydrocodone is available as a legitimate pharmaceutical, so notwithstanding its well-publicized and understood dangers, its sales (as Vicodin) topped 128 million prescriptions in 2009. This presents a massive risk for those who are suffering from such severe amounts of pain that they are willing to take Vicodin (hydrocodone) off-label; that is, they take more of the drug than they should, more often than they should. 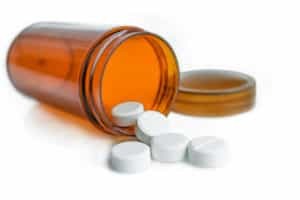 People who grow increasingly dependent on their hydrocodone supply to control the initial source of their pain might start taking their medication for reasons that do not fit with the prescription’s guidelines. The sensation of the opioid medication binding to the receptors in their brain is so pleasant and relieving that any reason of discomfort or distress, real or imagined, becomes a cause for taking hydrocodone. But even as they start to consume more and more of the drug, their bodies starts to adapt to the ever-present chemicals, so much so that the standard amounts of hydrocodone don’t do it anymore. Effectively, the body gets used to the hydrocodone, but the mind demands ever-increasing amounts, compelling people to up their intake. Since drugs with hydrocodone are dispensed by prescriptions only, people might resort to faking symptoms, consulting multiple doctors, or even forging prescriptions, in order to get more medication for what has, by now, become a dependence. As the person goes for longer periods of time without hydrocodone, the withdrawal symptoms can become even more uncomfortable. In extreme cases, the person can experience seizures if hydrocodone intake is not resumed. A person who is dependent on hydrocodone will generally feel the first of the withdrawal effects about 12 hours after the last dose. However, depending on a number of other factors (such as the person’s age, physical condition, the presence of other drugs in the system, etc. ), the first symptoms could present themselves as early as six hours after the last dose or as late as 48 hours after the last dose. Usually, the first symptom felt will be muscle cramping and related pain, as the lack of hydrocodone marks the first time that the brain’s opioid receptors are not being activated. This might be the first time the person has experienced physical pain since becoming dependent on hydrocodone, and that might make the sensation even more uncomfortable. As a general rule, the first 48 hours of withdrawal are generally the most difficult for people to endure. It is during this period that there is the greatest risk for relapse; that is, individuals are so overwhelmed by withdrawal symptoms that they resume their hydrocodone abuse, or seek out another substance to alleviate the pain of withdrawal. For this reason, people should not attempt to withdraw from hydrocodone on their own. There are too many health risks associated with the process for it to be conducted away from the supervision of a medical professional, in a clinical environment. Detox should always be done under the supervision of a doctor, who can administer medications as needed, to ease discomfort. After the peak of the first two days, the physical effects of withdrawal slowly start to balance out as individuals approach the end of the first week without hydrocodone. There will likely be some lingering discomfort (or even pain), so individuals should be given regular meals that are easy to digest, since they will be very physically weak by this point and need to have their strength gradually and healthily restored. Diarrhea is still a concern, so proper food should be administered (another reason why a person should not attempt to withdraw from hydrocodone alone, or without a medical professional present). However, it is also around this time that people experience depression because the lack of hydrocodone makes them feel bad, or because they are compelled to feel guilty and ashamed due to their addictions. As part of this stage of withdrawal, people may also have desperate cravings for more hydrocodone. A doctor, therapist, and/or a family member should be on hand to help people get through the mental symptoms of withdrawal with as much support and encouragement as possible. By the end of the first week or the beginning of the second week since the last dose of hydrocodone, people should be well enough to begin some light exercise. Something as simple as a leisurely walk will keep them physically and mentally fresh, helping their bodies heal after the ordeal of withdrawal and resting their minds before the next stage of their treatment. Medical detox can control or account for these factors to a much better degree than those who attempt to quit taking hydrocodone on their own can. Those checking into a treatment facility will be required to complete an intake and assessment procedure that will give facility staff all the relevant information they need to anticipate how these clients will react to detox, and then prepare for any eventualities. This will not happen if individuals attempt to detox on their own. Hydrocodone dependence is serious. Every day, nearly 7,000 individuals are treated in emergency rooms across the US for issues related to prescription painkiller abuse. But even as the federal government takes steps to reduce the number of opioid prescriptions that contain hydrocodone, the various methods people use and share the drugs (obtaining them from friends and family members, with or without consent) ensure that abuse continues. In 2012, the Drug Enforcement Administration tallied 36 fatalities and 29,391 cases of hydrocodone abuse. According to the 2013 National Survey on Drug Use and Health, 24.4 million Americans used hydrocodone for “recreational” purposes. TIME magazine estimates that 15,000 people die every year from overdoses on prescription drugs, suggesting that with the hundreds of millions of prescriptions written every year, individuals should be well aware of the risks and dangers of taking hydrocodone-based medications.